In this document, we will discuss using PhET in a guided worksheet. This is a strategy which has been found to support student learning [Chamberlain et al. 2014, Moore et al. 2013, Perkins et al. 2012, Moore et al. 2014]. See also our recommendation on Facilitating Activities using PhET. 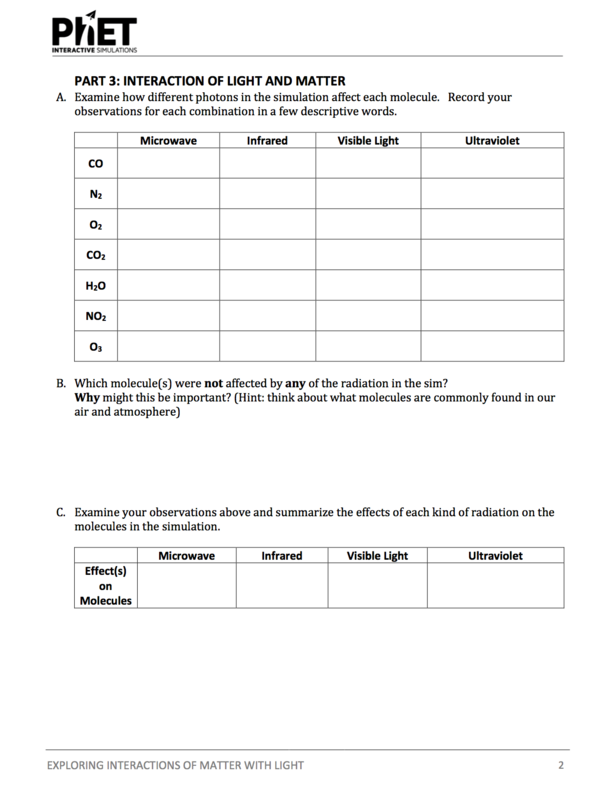 In particular, how do we help students use the questions and the simulation to think about the physics, or to practice new skills – not just focus on getting to the end of the worksheet? We have developed significant resources for the K12 community around activity design and facilitation, which may also serve as useful resources. See Designing Activities for K12 and Facilitating Activities for K12. 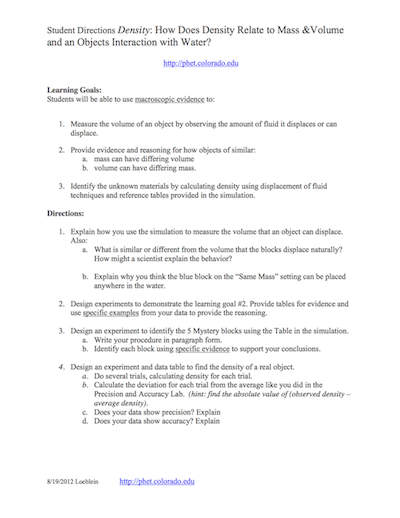 Our one-page guide to PhET Activities using Guided Inquiry is another helpful resource. Activity worksheets should be as short as possible -- aim for 4 pages or less, covering about 3 learning goals. It might be better to have several shorter activities than one longer one, to keep students focused on the key ideas. Longer activity sheets can lead to a focus on just ‘getting through’ the entire activity, and reduce your opportunities to have rich discussions with your students. Eliminating any explicit instructions on how to use the simulation often helps to keep the worksheet concise. For a good example of a short activity, click the thumbnail to the right. Within the activity, use short, simple questions, leaving plenty of open space for student work. Keeping it simple allows opportunities for students to engage in meaningful exploration and discussion of the simulation. 2. Start with open exploration time. Supports student engagement and ownership with the sim and their learning. What are you writing for the other half of part two? Let’s say “decrease.” What’s the next question? They’ll be further apart, the more the charge is? Can we move the slider bar so we can see if the distance increases? Wait, why does it look like that? Find all the ways to… blow the top off the box. What’s the biggest… orbit you can make? How many… collection boxes can you fill in 5 minutes? List all the essential items to…make a circuit. 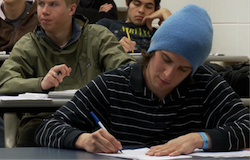 What are two ways to…increase the kinetic energy of the skater? How can you make…the gravity force…bigger? How can you create … the smallest non-zero acceleration? Develop a procedure for … identifying an unknown material (e.g., in Density sim). 5. Build on students’ prior knowledge, and connect to the real world. Also, ground your questions and ideas in familiar, real-world experiences. Students learn more when they can see that science is relevant to their everyday life. Where possible, ask questions in the activity that help them relate science to their personal experience. 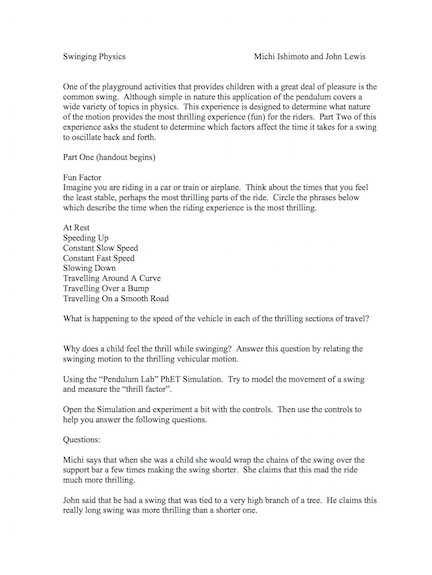 For example, in a simulation exploring pendulums, ask students to think about their experience riding a swing. 6. Make use of sim features and examples. When you’re first trying to create an activity (for in-class or recitation use) which uses the PhET simulations, be sure to sit down and play with the simulation yourself, to see what it can do. How will you help students achieve your learning goals? If you are writing an activity for lab use, how will the simulation complement any real-life equipment? Find ways to let the activity prompts complement the simulation, so that the two work together, rather than compete for attention:. Students are drawn to games or challenges in the sims. Leverage these games by using them in the activity itself, rather than forcing students to choose between what the sim encourages and what the activity asks for. Use the visual nature of the sim to your advantage, and ask students to explain phenomena with both words and pictures. 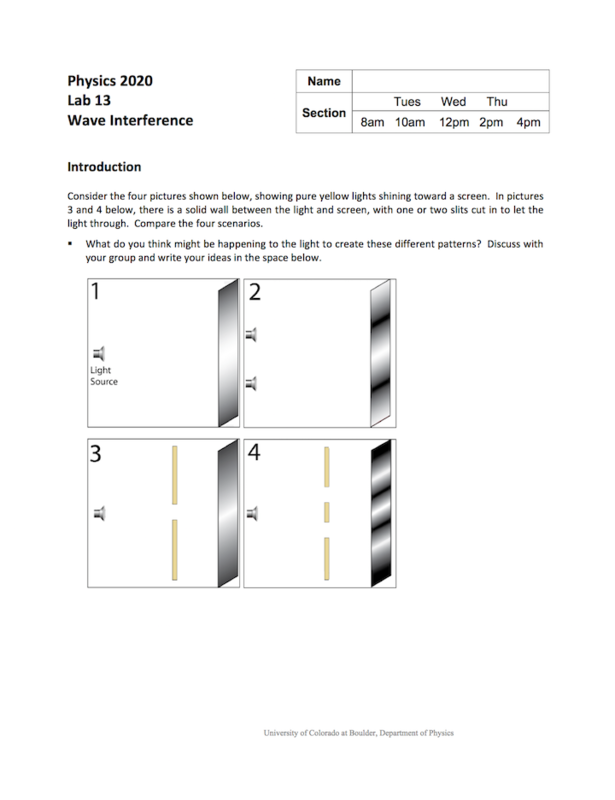 You can also incorporate sim images and representations into the worksheet itself. Keep your questions focused on the simulation!! Keep conceptual questions focused on the simulation, to encourage students to view the sim as a useful resource. Save extension questions, that reference examples or values from outside of the simulation, for the end of the activity. 7. Help students check their understanding. As a whole class: Facilitating class discussions or clicker questions at intervals during the activity can help you check-in with student groups and ensure that students are on the same page with their understanding. More tips on effective activity facilitation can be found here. 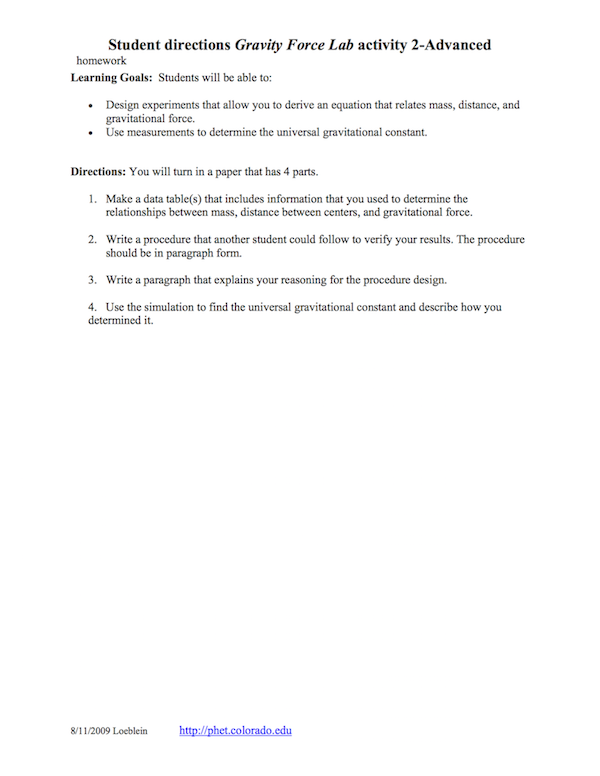 Self-checks: Students can check their own understanding using the simulation. For example, ask students them to predict something based on their new knowledge and then check their prediction with the simulation. Tables help focus students on productive investigations, without needing many directions or overwhelming students with detail. Plus, when students to record responses to open-ended questions in tables, it’s easy for facilitating instructors or TAs to see student progress at a glance. What makes a table effective? Keep tables open, with minimal wording and plenty of space for written observations and/or actions. Use checkboxes to give quick checks of understanding that the instructor or TAs can make note of while facilitating. Think beyond data -- tables can be used to catalog a wide variety of ideas. 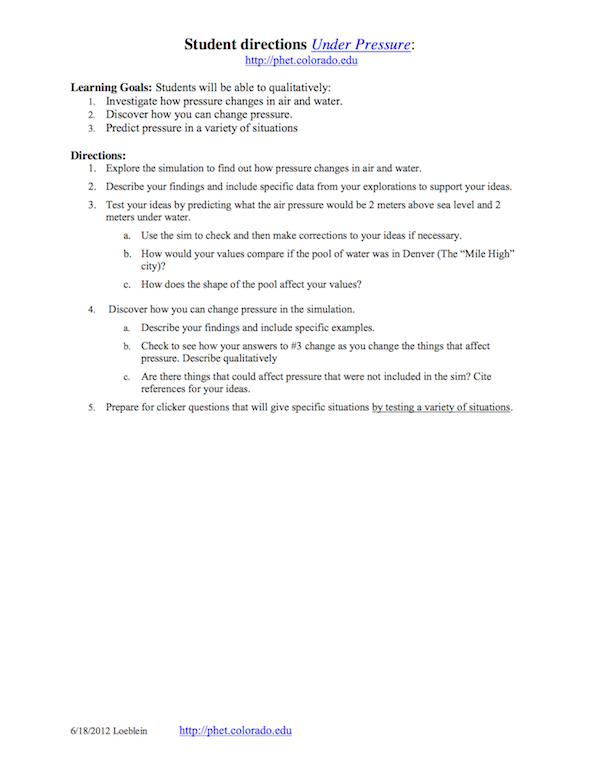 What can a table prompt students to do? How can you tell something is a good conductor of electricity in the sim? How can you tell something is a weak conductor of electricity in the sim? How can you tell something is an insulator of electricity in the sim? Orient students to just the key sim features, rather than drawing unnecessary pictures of sim details. Describe at least 2 different ways that you were able to balance the objects with different masses and draw them below. To see how these recommendations play out in practice, check out some of these examples. More activities are available on our Teaching Resources page. 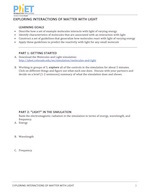 Students construct guidelines to determine how molecules react with light of varying energy. Find this activity on PhET. Students observe interference patterns, and explore cause and effect relationships. (Includes the use of real-world equipment for a laboratory component). Credit: University of Colorado Boulder Physics. 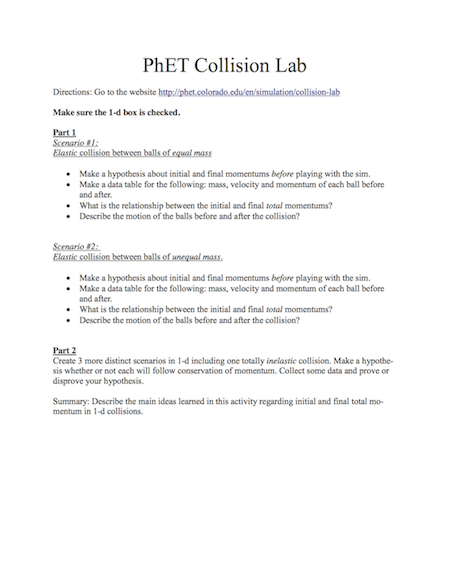 Students conduct experiments to investigate momentum conservation in collisions. Can be used as a lab activity. 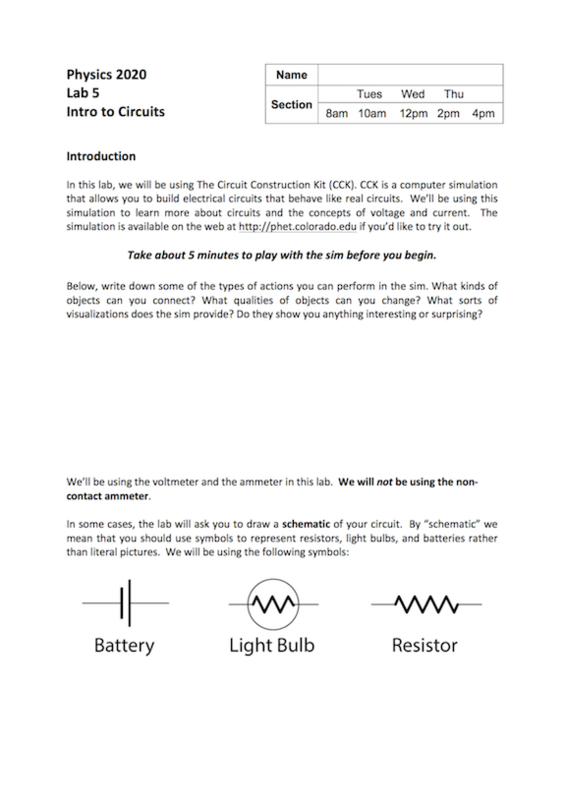 Students use the Circuit Construction Kit, and real equipment, to explore the behavior of circuits. Can be used as a lab activity. Students investigate pressure, and predict how it will change in different situations. Can be used as a lab activity. Students design experiments to relate mass, distance, and gravitational force. Can be used as a lab activity. Students use the Masses and Springs simulation as a virtual lab, including taking measurements and identifying the acceleration due to gravity on Planet X. Can be used as a lab activity. Students use the Density simulation to measure the volume of an object, explore ideas about mass and volume, and identify an unknown material. Can be used as a lab activity.